Environmental metagenomics is a challenging approach that is exponentially spreading in the scientific community to investigate taxonomic diversity and possible functions of the biological components. The massive amount of sequence data produced, often endowed with rich environmental metadata, needs suitable computational tools to fully explore the embedded information. Bioinformatics plays a key role in providing methodologies to manage, process and mine molecular data, integrated with environmental metagenomics collections. One such relevant example is represented by the Tara Ocean Project. We considered the Tara 16S miTAGs released by the consortium, representing raw sequences from a shotgun metagenomics approach with similarities to 16S rRNA genes. We generated assembled 16S rDNA sequences, which were classified according to their lengths, the possible presence of chimeric reads, the putative taxonomic affiliation. The dataset was included in GLOSSary (the GLobal Ocean 16S Subunit web accessible resource), a bioinformatics platform to organize environmental metagenomics data. The aims of this work were: i) to present alternative computational approaches to manage challenging metagenomics data; ii) to set up user friendly web-based platforms to allow the integration of environmental metagenomics sequences and of the associated metadata; iii) to implement an appropriate bioinformatics platform supporting the analysis of 16S rDNA sequences exploiting reference datasets, such as the SILVA database. We organized the data in a next-generation NoSQL “schema-less” database, allowing flexible organization of large amounts of data and supporting native geospatial queries. A web interface was developed to permit an interactive exploration and a visual geographical localization of the data, either raw miTAG reads or 16S contigs, from our processing pipeline. Information on unassembled sequences is also available. 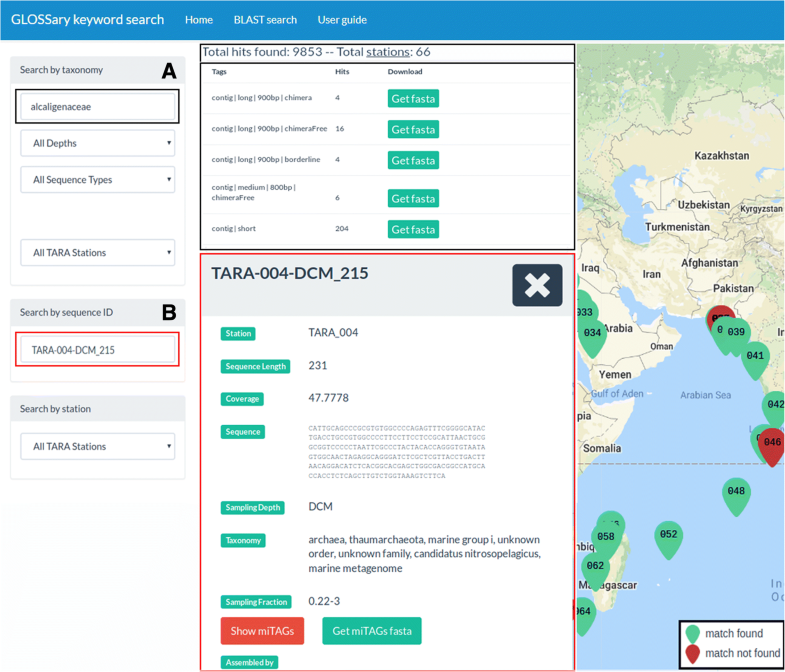 The taxonomic affiliations of contigs and miTAGs, and the spatial distribution of the sampling sites and their associated sequence libraries, as they are contained in the Tara metadata, can be explored by a query interface, which allows both textual and visual investigations. In addition, all the sequence data were made available for a dedicated BLAST-based web application alongside the SILVA collection. GLOSSary provides an expandable bioinformatics environment, able to support the scientific community in current and forthcoming environmental metagenomics analyses. Environmental metagenomics is a challenging approach that has rapidly expanded in the last decade thanks to advanced high throughput sequencing technologies. Massive amounts of sequence data are being produced, accompanied by information annotating spatial localization of the sampling sites, as well as other useful data related to the environmental conditions (e.g. nutrient concentrations, temperature ), which represent some of the driving factors that can shape community structures by resource partitioning  and influence biological processes . Metagenomic approaches are mainly focused on the analysis of microbial communities, fostering a deeper characterization of prokaryotic and eukaryotic diversity. The exploration of marine microbial communities is expanding to integrate classical phylogenetic analyses with information from environmental data and spatial-temporal variation of such communities . Important efforts, indeed, aims at considering multilevel aspects, such as molecular, biological, physical, and chemical data for holistic approaches to the study and the understanding of the processes which regulate Earth’s biogeochemical cycles and climate . The global ocean exploration that started in the last two decades is contributing enormously to this aim. The Sorcerer II expeditions (2003–2010) and the Malaspina expedition (2010–2011) carried out surveys for exploring microbial diversity from the ocean surface down to bathyal depths (> 1,000 m). The Tara Oceans Expedition (2009–2013) is by far the most recent and largest expedition, aimed at investigating microbial and eukaryotic diversity at global scale . These research efforts result in the production of a huge amount of data; as an example, the Tara Oceans expedition resulted in the collection of over 35,000 samples of seawater and plankton, with most of the data represented by sequence data . The analysis of such “Big Data” collections requires huge collective efforts, addressed by several and independent research teams [6–11]. However, the amount of produced sequence data requires dedicated infrastructures to be fully exploited and properly analysed, and this represents one of the most daunting challenges in the field of environmental ecology. Organising such collections and their precious and multifaceted information content by suitable bioinformatic tools represents a key step to foster both data mining and collaborative research and discovery [5, 6], with relevant impact for a better understanding of microbial diversity and factors influencing its distribution. Previous attempts at the creation of sequence storage and analytical platforms, dedicated to the study of environmental sequence data, included the CAMERA database , which is now discontinued; the VAMPS system , for ribosomal sequence analysis; the MG-RAST server for metagenomics and metatranscriptomics ; and QIITA , which acts as a sequence analysis platform serving as a repository for the Earth Microbiome Project . However, none of them currently supports metadata-enabled dataset exploration. To test a novel computational framework for the management and the analysis of environmental omics collections, we designed a document-oriented schema-less database together with a web interface with the aim of setting up: i) a suite using alternative computational approaches to manage challenging metagenomics data; ii) a user-friendly web-based platform to allow the integration of environmental metagenomics sequences and of the associated metadata; iii) an appropriate bioinformatics platform to support the analysis of 16S rDNA sequences while exploiting reference datasets, such as the SILVA data collection . Although public sequence collections have been recently distributed through the European Nucleotide Archive  by the Tara Ocean consortium, 16S sequence data are only available in the form of raw reads, also providing a basic summary of the associated diversity. However, to our knowledge, no sequence curation is provided yet. Therefore, we decided to start the implementation of the platform here proposed including data from this relevant collection. We considered the 16S miTAGs [8, 19] originally retrieved from shotgun sequencing data by means of specialized HMM-based pipelines focused on ribosomal 16S rRNA gene sequences within the 0.22–1.6 μm / 0.22–3 μm size fractions of water samples processed by the Tara Ocean consortium. We processed the miTAGs data, and classified complete or partial sequences, as well as potential chimeric and chimera-free sequences, providing taxonomic affiliation by means of the SILVA 16S gene sequence database. We organized all the sequence data and their associated metadata in the platform and designed suitable analytical tools to browse the entire collection, aiming to support in-depth exploitation of this precious resource. Tara miTAGs libraries, representing 16S rDNA sequence tags extracted from Tara raw reads (thus not including 18S sequence data), as well as all the metadata related to all libraries and to the specific Tara stations, were downloaded from the Tara Ocean companion website (http://ocean-microbiome.embl.de/companion.html). MiTAG libraries were produced from shotgun sequence data from the 0.22–1.6 μm / 0.22–3 μm size fractions of water samples generated by the Tara Ocean consortium, by means of specialized HMM-based pipelines focused on prokaryotic ribosomal 16S genes. Sampling depths are reported per library and correspond to surface oceanic waters (“SRF”), epipelagic waters (“MIX”), waters sampled at the deep-chlorophyll maximum (“DCM”) and mesopelagic waters (“MES”) [6, 7]; libraries were assigned to stations, depth layers, marine biomes and oceanic provinces according to the metadata provided in . MiTAG sequences from each library were independently assembled by the MEGAHIT software . MEGAHIT was chosen because it achieves a reasonable resolution of 16S rRNA genes micro-diversity (intended as 16S gene sequence variants with an overall similarity higher than 97%, e.g. 1–3 nucleotides) during the assembly, as reported in . MEGAHIT was used with the following settings: k-mer lengths from 21 to 99 (with a k-step of 10) and a minimum coverage of 2 sequences (to maximize assembly sensitivity). Other parameters were left as default. This allowed us to discern prokaryotic strains potentially differing for few nucleotides in their 16S genes, thus broadening our view of prokaryotic diversity in marine habitats. To detect sequences presumably used to build each assembly, and remove sequences with ambiguous mapping, miTAG sequences from each library were indipendently mapped to all assembled contigs using the BBMap tool (https://sourceforge.net/projects/bbmap/), with a minimum identity threshold of 97% (minid = 97) and all the other in the default settings. Mapped and unmapped (i.e. singletons) sequences were therefore associated to each library from each Tara station and depth. The percentage of mapped miTAGs, i.e. the number of miTAGs mapped to each contig versus the total library size, was used as a proxy for defining the relative abundance of a contig in a library. This also represents the coverage of the contig, and is reported in the header associated to each contig sequence when exploring the database. Visualization of the resulting data and statistical analyses were performed within the R environment . Long and medium contigs were annotated using the assign_taxonomy function of the QIIME package (v1.9; ) using the SILVA v128  database as a reference. Both sets of contigs were independently checked for possible chimeras using the VSEARCH package , again using the SILVA v128 database as a reference. We therefore classified all long and medium contigs as chimeric (“chimera”), non-chimeric (“chimera free”) and “borderline”, accordingly. Taxonomy affiliations for short contigs (< 800 bp), as well as for the miTAG sequences, were obtained by a similarity search versus the SILVA database using the VSEARCH package using an identity cutoff of 80% and keeping the best hits. The complete pipeline is shown in Fig. 1. The database was implemented using MongoDB , a document-oriented NoSQL Database management system. Indeed, MongoDB permits to efficiently store and retrieve semantically similar data having highly different structures. More in detail, the database underlying GLOSSary holds together miTAG and contig sequences (i.e. semantically similar objects), although each type could have a largely different metadata set (i.e. structure). Data were de-normalized and split over several collections, taking into account query performances as one of the main criteria. Starting from a pre-defined set of queries and data-browsing requirements, data collections were built together with a first set of indexes to allow fast data retrieval. The sequences were stored in a dedicated collection. Each sequence data object was augmented with a set of metadata, which differ across miTAG or contig sequences. The sequences were then tagged using an indexed array of keywords, representing query filtering criteria exploited in the search engine. It is worth noting that each sequence object can be used to store large amount of data (up to 16 MB, as for the default per-document object limit in MongoDB). Due to the unstructured nature of the available data, a mix of single field indexes, geospatial indexes and text indexes were defined for each data collection to optimize data querying. To speed-up searches on large set of sequences (in the order of Millions of objects) a query caching approach was developed. The database general schema is represented in Fig. 2. The database can be accessed by a suitable query system through a web interface realized with a Pyramid stack (https://trypyramid.com/), a Python-based web framework. The web frontend was developed using HTML5, Bootstrap (https://getbootstrap.com/) and Jquery (https://jquery.com/). A BLAST service was implemented to allow similarity searches on raw 16S miTAG sequences, the contigs and the 16S full-length gene sequences from the SILVA database (v128) . The service was developed using the Sequence Server software .The BLAST service allows the user to compare one or more query sequences (provided in FASTA format) against different partitions of the data collections included in the platform. The resulting hits are cross-linked to the web platform above described. The total amount of sequencing data associated with the 139 miTAG libraries available on the Tara Ocean portal corresponded to 14,129,971 miTAG sequences. Of these, 3,489,675 reads (representing, on average, ca. 25% of the raw miTAGs in each library) were assembled in contigs, according to the in-house implemented pipeline (Fig. 1). On average, ca. 5% of the total resulting contigs (103,954 sequences) was greater or equal to 800 bp in length and identified as potentially non-chimeric. An additional table shows this in more detail (Additional file 1). The number of miTAG libraries obtained for each marine province of the Tara sampling was very variable, with the highest number of libraries (27) in the South Pacific Subtropical Gyre Province (SPSG). Surface layers (“SRF”) were represented across all provinces, but deeper layers (i.e. deep-chlorophyll maximum (“DCM”), epipelagic mixed waters (“MIX”) and mesopelagic waters (“MES”)) were not: indeed, a total of 63 SRF, 42 DCM and 30 MES libraries were produced, and some layers were entirely missing (e.g. the DCM layer from the Gulf Stream province) A visualization of this unevenness is shown in an additional figure (Additional file 2). The number of sequences included in each miTAG library was highly variable (Additional file 1), ranging from the small content of 39410 sequences in the TARA-066-DCM library (Benguela province, DCM layer) to the 186,898 sequences in the TARA-064-SRF library (Eastern Africa Coastal province, SRF layer). However, more than 24% of the sequences across all libraries (up to 43%) were successfully assembled. The platform is organized in two independent partitions: 1) a database including sequence data and metadata, and 2) a BLAST based platform including miTAGs and contigs, together with the 16S full-length sequences from the SILVA database (v128). All raw and assembled sequences (i.e. miTAGs and contigs) were uploaded into a MongoDB Database management system (DBMS). The sequences are characterized by a “tag”, i.e. 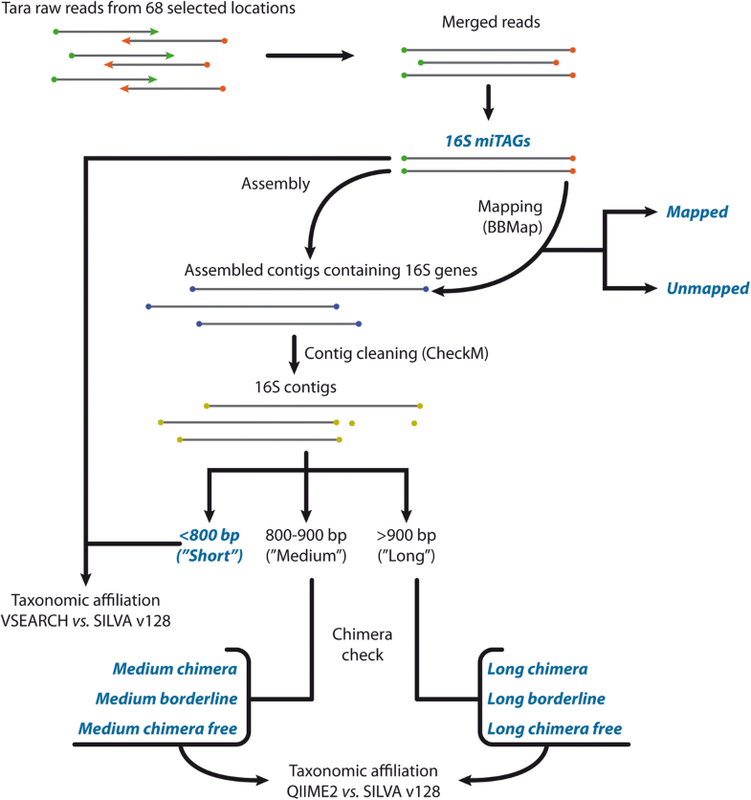 a descriptive string reporting the classification of several features such as: i) mapped and unmapped status for each miTAG; ii) contig classification (long, medium and short) and iii) contig contamination level (chimera free, chimera and borderline). Information about the metadata (such as Tara station ID, depth and fraction) associated to each miTAG were kept and used as added “tags”. Both the miTAGs and the 16S contigs can be explored through the web page http://bioinfo.szn.it/glossary (Fig. 3a). Two main sections are accessible: a “Query Search” page (Fig. 3b) and a “BLAST Search” service (Fig. 3c). The “BLAST Search” service allows the user to compare one or more query sequences (to be provided in FASTA format) against different subsets of the data included in the GLOSSARY database. Moreover, among the datasets made available in the BLAST partition, we also included the SILVA 16S full-length sequences, to allow cross comparisons between the entire data collection organized in the database and a reference database (Fig. 3c). The user can select one or more of the included collections, and the alignments in the classical BLAST output format are shown. In the “Query Search” area of the platform, three main entry points are currently available. The “Search by taxonomy” allows a query by keyword based on taxonomical classification; the “Search by sequence ID” allows to use miTAGs or contigs identifiers to access each single sequence features; the “Search by station” allows to access to all the runs and the miTAGs belonging each Tara station. An interactive geographic map can be also exploited independently, or can accompany each query by the appropriate result. The map changes according to the results of each query, highlighting in green all stations containing sequences associated with the searched keyword, thus permitting an immediate and dynamic view of the geographical distribution of the stations associated to each query. In detail, the “Search by taxonomy” query field allows to perform the search specifying the available taxonomic affiliations while typing one or more chars. A dropdown list appears accordingly supporting the selection. The list includes all the taxa that are associated to at least one of the sequences included in the database (Fig. 4a). Furthermore, it is possible to further specify the query by selecting: i) the sampling depth: “Surface Oceanic” (“SRF”), “Deep-Chlorophyll Maximum” (“DCM”), “Epipelagic” (“MIX”) and “Mesopelagic” (“MES”); ii) the sequence type, i.e. “All Sequence Types”, “miTAGs” or “16S Contigs”; iii) when searching for “16S Contigs” it is possible furthermore to select the contigs by length (“All Contigs Length”, “Long (> 900bp)”, “Medium (> 800bp and < 900bp)”, “Short (< 800 bp)”); iv) when searching for “miTAGs” it is possible to choose among “All miTAGs”, “Mapped” or “Unmapped” sequences, thus identifying all sequences types including those that resulted as singletons at the given similarity threshold; v) the Tara station ID: “All TARA Stations” or, selecting from the dropdown list, a specific station ID. The query results are visualized next to the search boxes and provide information on the total number of hits and stations found for the selected criteria (topmost line, Fig. 4a) and a table, showing the number of hits found for each tag. Result sequences are downloadable in a FASTA formatted file (Fig. 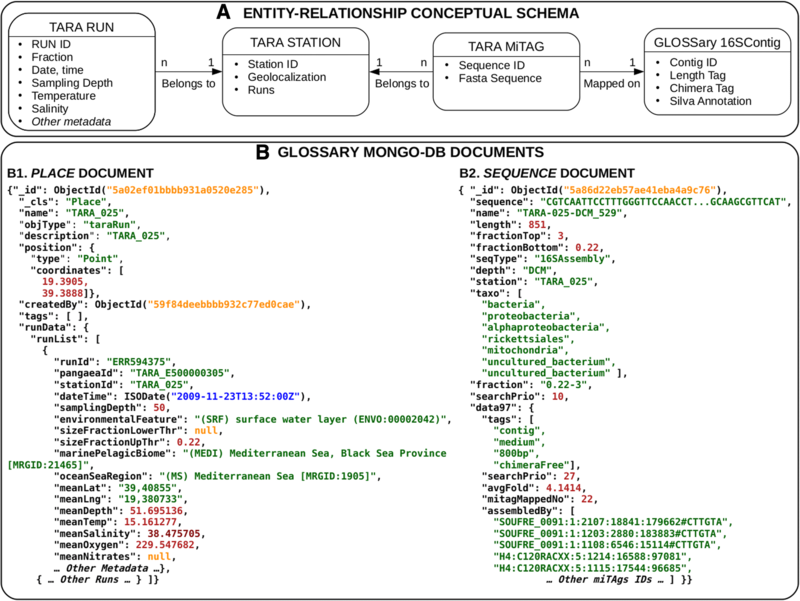 4a), whose headers contain information on the Tara station from which the sequence was reconstructed, alongside with size fraction, depth layer, taxonomy, sequence tags and coverage information. By clicking with the mouse on the “total stations” link in the summary line, it is possible to visualize the list of hit counts for each station. By searching for a specific sequence ID in the “Search by sequence ID” box it is possible to obtain information on the sequence and its length, the corresponding Tara station, the sampling depth and fraction, and the complete taxonomic affiliation. In the case of contigs the coverage is available, and the miTAGs sequences mapped at the specific threshold are also accessible, whereas, in the case of miTAGs, their status in terms of mapped or unmapped to contigs is reported too (Fig. 4b). Finally, searching by Tara station IDs in the dropdown menu of the “Search by station” box allows to obtain the list of the raw runs for each station, each linked to the NCBI SRA download page, as well as the list of the miTAGs sequences (as FASTA archives) organised by depth (Fig. 5). For all the search types, the resulting stations are highlighted in green on the map. The map itself can be interactively explored: holding the left button of the mouse it is possible to grab and move the map, and by clicking on a station the related information will be shown. The preliminary overview of our results reveals that the percentage of high-quality 16S fragments assembled (all sequences > 900 bp, and chimera-free vs. the total number of contigs assembled) was rather homogeneous across different water depths, ranging from an average of 2.6% for all MES layers to an average of 4.4% for all SRF layers (Additional file 1). 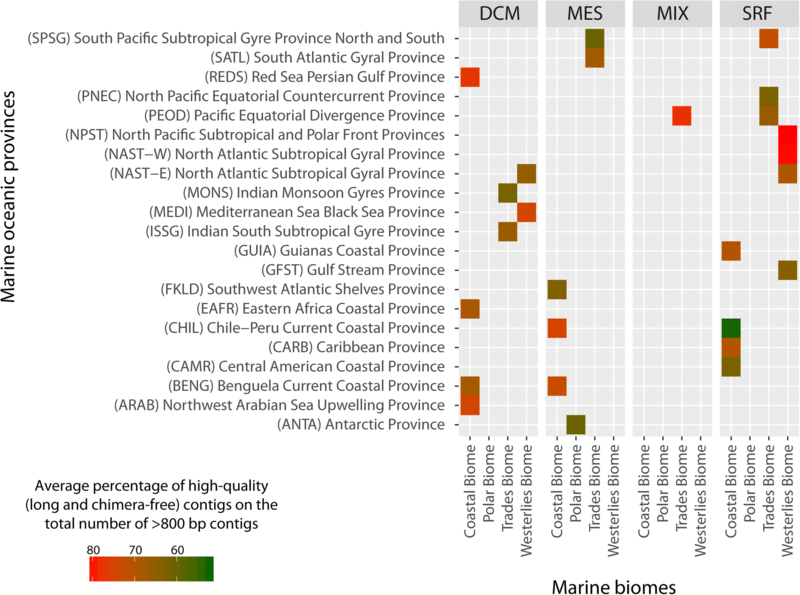 Interestingly, a high fraction of high-quality fragments (> 6%) was assembled from both the Antarctic province and the Indian Monsoon Gyres province (from SRF and MES layers, respectively), whereas the lowest fraction of high-quality gene fragments was assembled from the MES layer of the Chile-Peru Current Coastal province. No significant relationship was found between the percentage of assembled sequences and the number of high-quality contigs identified. The number of putatively chimeric contigs represents a variable fraction of the total number of long contigs, ranging from 0% up to 32% for contigs longer than 900 bp to more than 60% of the contigs between 800 and 900 bp, across all samples (Fig. 6). 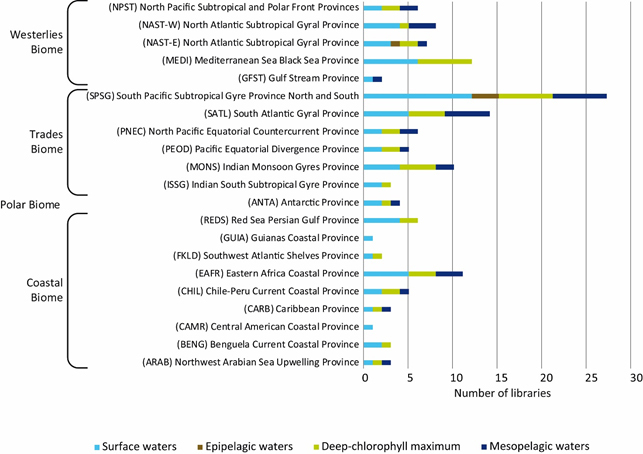 We analysed the geographical distribution of long contigs and represented their relative abundance in terms of number of miTAG per contigs per phylum. Contigs which could not be assigned to any known phylum were also reported as “Unassigned” (Fig. 7). 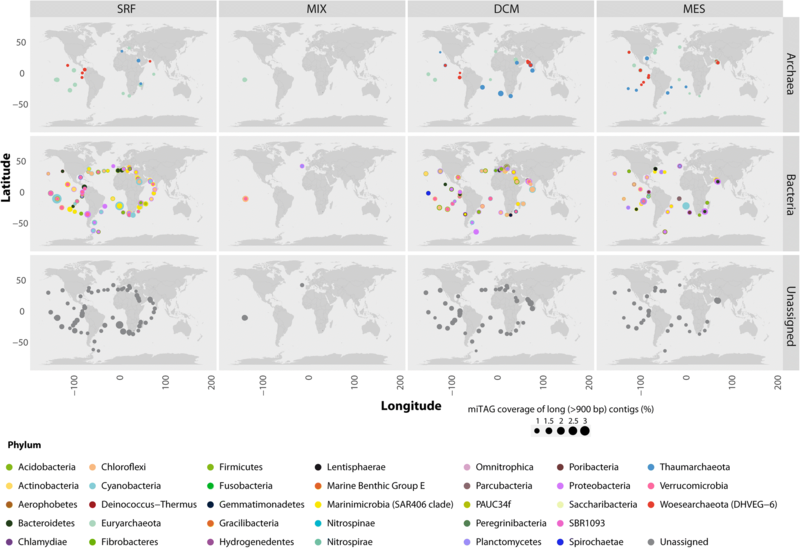 Overall, the average coverage of long contigs reproduced known spatial patterns of prokaryotic abundance in the global ocean where Archaea show a limited distribution in comparison with Bacteria. Interestingly, “Unassigned” contigs are rather frequent and represented in the overall collection, revealing the wideness of still uncovered information on possible prokaryotic phyla. 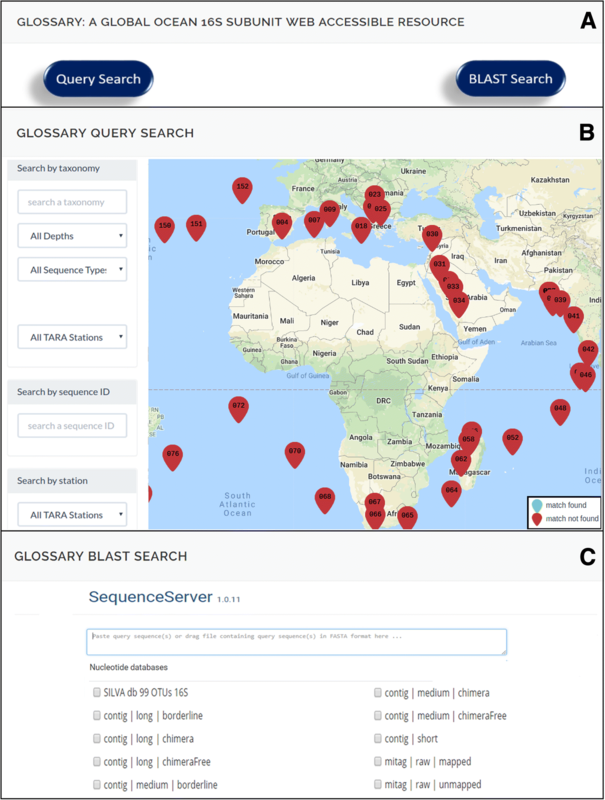 The current release of the GLOSSary platform aims at favouring the exploration of 16S rRNA gene sequences from large-scale environmental samplings. The database is designed for friendly scalability and multifaceted data uploading. The more conventional sequence based investigations are supported by views that favour environmental metadata exploitation. 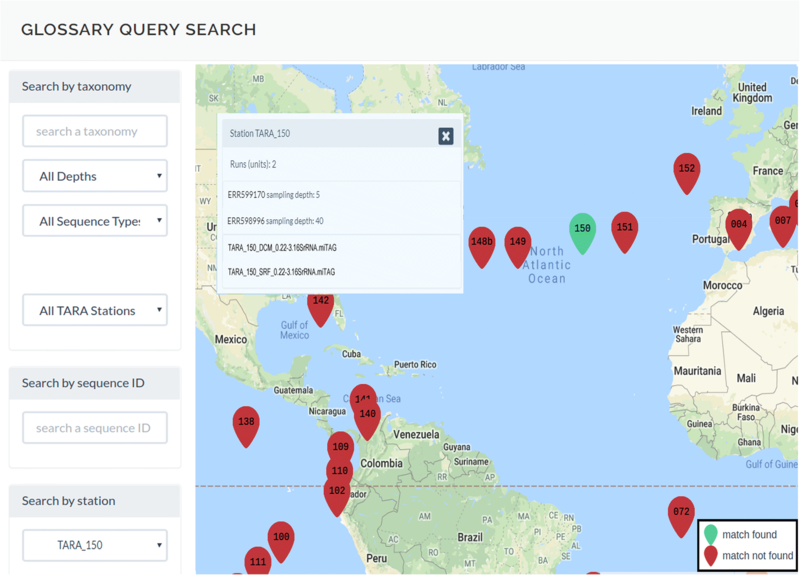 The current release of the platform includes 16S data processed from the miTAG collection released by the Tara Ocean expedition and allows not only to identify the location of specific prokaryotic families, but also to investigate their coexistence with user-driven queries, allowing explorations of ecological and phylogenetic issues. Future efforts will be focused on the inclusion of more 16S data from similar ongoing efforts, to establish a reference resource for the investigation of prokaryotic diversity embedded in the environmental context. Project name: GLOSSary - the GLobal Ocean 16S Subunit web accessible resource. Operating system(s): Platform independent (web-server). M. Tangherlini and M. Miralto contributed equally to this work. We thank Chris Bowler (Institut de Biologie de l’Ecole Normale Supérieure (IBENS), France) and Daniele Iudicone (Stazione Zoologica “Anton Dohrn”, Naples) for updates on the Tara effort and on the status of available collections. We thank Pier Luigi Buttigieg (MPI for Marine Microbiology) and the task force on “Omics observatories” for useful discussions on environmental metagenomics. The present work was supported by the SZN (Stazione Zoologica “Anton Dohrn”) flagship project BIOINforMA: BIOINformatics for MArine Biology, which also covered publication costs for this manuscript. The GLOSSary database and service is publicly available at http://bioinfo.szn.it/glossary/. MM designed the MONGOdb database and the associated query system. ChC and MS organized the BLAST partition of the platform, MT processed the sequence data, MT and ChC checked and validated raw miTAG sequences; CiC, AD and RD supervised the entire scientific effort and tested the platform. MLC conceived the strategy and the platform and supervised the entire effort, MM realized the schema-less database and made the computational effort concrete, MT proposed and designed the analysis on 16S data. All authors read and approved the final manuscript. Tara Ocean portal at the European Nucleotide Archive https://www.ebi.ac.uk/ena/data/view/PRJEB7988. Accessed 15 Nov 2017. MicroB3 network. https://www.microb3.eu/ Accessed 01 Mar 2018. MarRef database. https://mmp.sfb.uit.no/databases/marref/. Accessed 1 Mar 2018. Tara Ocean Gene Atlas: http://tara-oceans.mio.osupytheas.fr/ocean-gene-atlas/. Accessed 1 Mar 2018. Villar E, et al. The Ocean Gene Atlas: exploring the biogeography of plankton genes online. bioarXiv. 2018. https://doi.org/10.1101/271882.